At least once, we all dreamt of having the special power to transform ourselves into someone else. Just like a quick-change performer, who dresses up to inhabit thousands of different characters, such as cartoon heroes or one of those robots with superhuman strength! 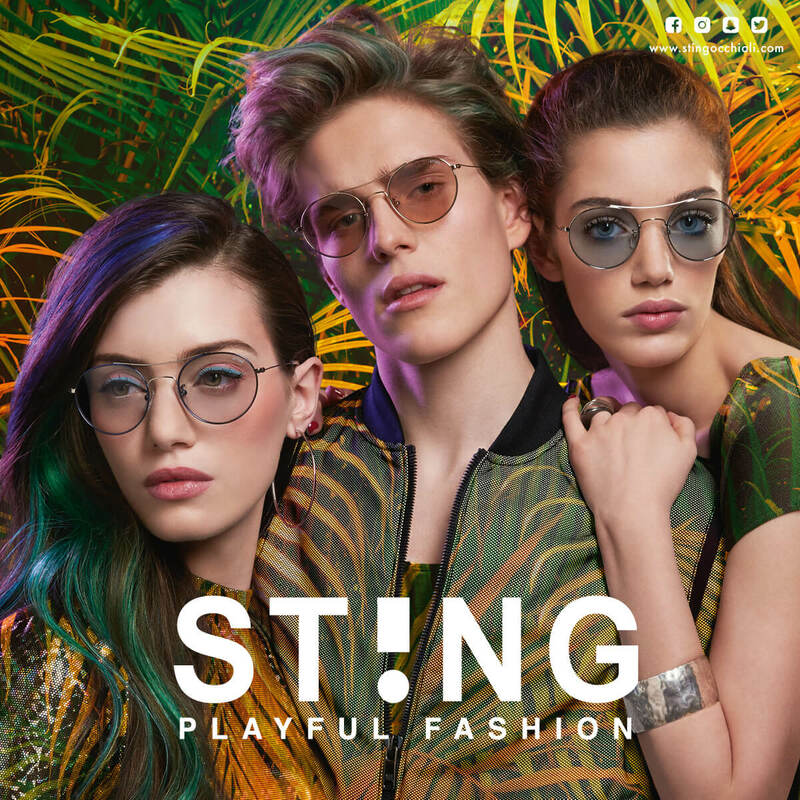 ST!NG Eyewear has always loved those who are not afraid to challenge the rules. That’s why “Transformation!” is the motto of the 2018 collection, which recalls Millennials’ attitude to break the mold and never be the same. For them, fashion means experimenting new trends, often inspired by social networks. Funny shapes to play with and to look different depending on the mood; timeless but unusual glasses with interchangeable clip-ons, made of very light materials and super colored nuances – these are perfect elements for those who wear, create or even… transform fashion! Before becoming one of the most beloved sunglasses shapes ever, the double-bridge aviator frame was mostly used as eyeglasses in the Seventies. Today ST!NG launches the iconic model in the brand-new transforming version, with an ultra-thin and extremely flexible metal frame. Thanks to a comfortable mirrored clip-on, available in three different colors, the eyeglasses change their shape and become … sunglasses! Two eyewear in one, for those who like to be always on trend with an eye on usability at the same time. Even a total black look can be livened up and personalized! The trick is to focus on accessories such as Playlist, the new women’s round eyeglasses by ST!NG. Available with a super colored tortoise pattern or in a two-toned variation, Playlist is the answer to those who love classic shapes, enriched with original details. The flex temples make it extremely resistant and therefore suitable for everyday life. Glasses inspired by digital natives, just as the name suggests: always ahead of the game and hyper-connected. They influence and share all the brand-new trends they love and… wear first, of course! That’s why Blogger really stands out: be it for the ultra-thin and light frame, extremely comfortable, or for the mirrored lens in five different colors, which allow a clear vision and high protection from the sun’s rays. You will forget to wear sunglasses … but everyone will notice them! The ultimate transforming sunglasses change according to your mood. The iconic ST!NG pilots become a practical mirrored mask in this version, available in four different shapes. Thanks to a magnet, it can be easily removed and replaced. For an easy-going look or a strong style statement, Cover is the eyewear for those who reject trends diktats and prefer to reinvent their style every day. The right sunglasses 24/7, 365 days a year, no matter if it is raining or sunny: Trend is a must-have fashion accessory, which makes up your face with the flattering touch of its cosmetic lenses. Thanks to its soft tones and a light and flexible frame, these sunnies are suitable for every moment of the day, from morning in the city center to evening at the disco! The ideal playmate is Activity, resistant to shocks and scratches and perfect for children who want to forget about wearing glasses. Thanks to the rectangular frame, which combines acetate and metal, this model is ultra-light and comfortable to wear. The double coloring gives Activity eyeglasses a trendy and funny touch. Children just love to dress up and turn into someone else! The ADD eyeglasses are designed to satisfy their desire for creativity. Thanks to a special magnet applied to the frame, they can easily add a clip-on with polarized lenses, turning ADD into sunglasses. The special ULTEM material makes this model super resistant and indestructible. Comfortable and lightweight, ADD offers reliable protection against the sun’s rays.